It would be hard to pass this off as an ordinary TV. 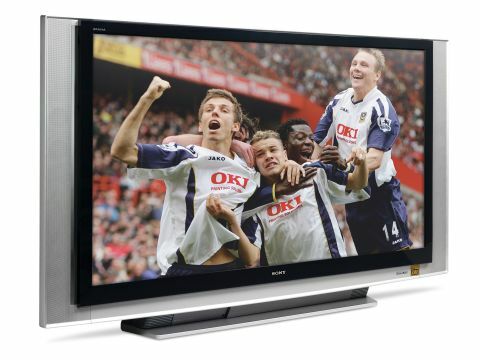 You could stand a giant next to it and pretend it's a 37incher but giants don't exist and if they did few of them would have £4,000 to spend on a 70in TV. Well, that's two hard facts out. Perhaps we should add that the KDS-70R2000 uses SXRD technology within a rear projection body and that it fulfils all the 'full HD' criteria known to man and beast. Quite a lot to go on then especially after the success of its 'little' brother the 5-star 55-inch version we looked at in our last issue. As listed, the socketry is excellent as is the 10000:1 contrast, 2.5m response time and the existence of that venerable engine of industry, the Bravia. For £4,000, it should supply a spare lamp, and it does. It also maps pixels 1:1 without overscanning. If much of this means little to you, rest assured that, like the price, it's a lot. Happily, this big, clever box of tricks gets even more impressive when switched on. What's most noticeable is the absence of either one or the other group of picture failings we have become used to with plasma or LCD. The striking black levels are the best we've seen on a rear-pro with plenty of subtle colours losing their timidity and stepping out of the grey shadows. In brighter scenes, colours looked full and bright and natural and passed the smear test when covering motion too. We tested it with Sky HD's Premiership action and found that the rich reds and blues of the teamshirts were subtly offset by the pinkish mottle of several of the players faces. The sagging jawlines of the heftier punters complemented deep shadows under eyes while the spittle flew drop by oval drop towards the players along with their kind words of encouragement. And for the horticulturally minded, yes, you can see some of the individual blades of grass. Standard definition pictures aren't meant to be so detailed so it's no surprise they gained a film of visual vagueness, but were still much better than most. Sound wise, it's no surprise that the KDS-70R2000 passes muster though few spending this much will rely on an onboard system. This brings us back to the cost. You may need to play in the Premiership to buy one, but if injury strikes, you'll be glad you flashed your Amex.